SAP has released the first “Feature Pack Stack” (FPS), SAP S/4HANA on-premise FPS01 for the 1610 release, on February 22, 2017. This is the first in a sequence of FPS’s that will be delivered twice a year and introduce new optional capabilities. This blog will highlight some of the key innovations of this year’s FPS01 shipment for you. SAP S/4HANA 1610 FPS 1 introduces support for SAP HANA 2, the second generation of SAP’s groundbreaking in-memory database platform. This allows customers to benefit from the latest innovations in the database system. For example, the active/active feature of HANA system replication makes it possible to redirect read-only workload to the secondary system of a high-availability cluster. Multiple Fiori applications and other analytical functionalities in the S/4HANA system have been enabled to make use of this feature. Another highlight is the introduction of support for SAP HANA scale-out, scaling SAP S/4HANA to the largest system sizes. 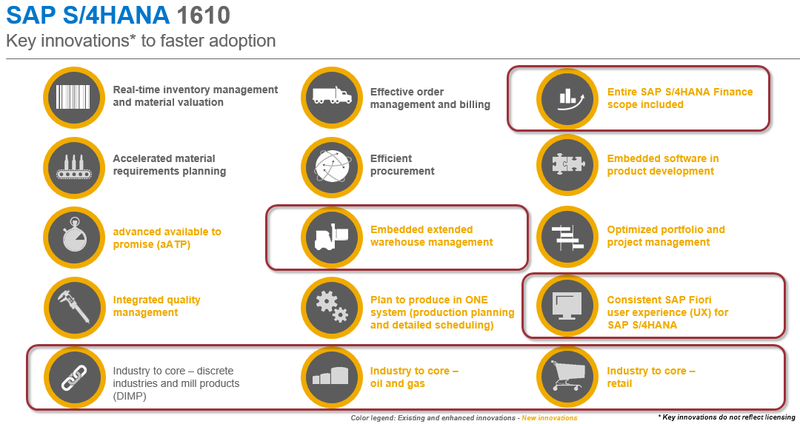 The picture below provides an overview of the key innovations that were shipped with SAP S/4HANA 1610: enhanced innovations in grey and completely new ones in yellow. The marked ones play an important role for this feature package as there have been major enhancements. embedded extended warehouse management, industries, SAP Fiori apps and finance. The latter has been improved particularly by adding new localizations. Let’s take a deeper look at the improvements for the different industry solutions. For a role-based engagement across the business, the assignment and visualization of SAP Fiori apps and classical transactions is optimized in SAP S/4HANA 1610 FPS01 for all retail roles. With SAP S/4HANA 1610 FPS01, the cross-system integration of article master data between S/4HANA and SAP ERP is simplified and revised. Moreover, SAP simplified the Cross-System integration and further harmonized Business Partner (BP) and Site. With the enhanced duplicate check, you can now use the event 7530 to add customer-specific duplicate search algorithms to the features of the contract partner duplicate check or to refine the duplicate result determined by the SAP standard algorithm. The navigation when using the business partner duplicate check in transaction PSOBWORK has been simplified. Data preparation in the master data transfer supports data preparation for transfer-relevant data on a dialog box and the highlighting of critical values. The new lock reasons for business transactions now allows you to represent specific business processes (such as stop dunning), you can now define lock reasons for dunning, interest surcharges and for clearing postings in the associated sub-transactions. Generic Object Service (GOS) is now available for the contract object. Last but not least: additional contracts can be displayed, providing the possibility of provider and real estate contracts being displayed with existing contract objects. SAP not only enhanced the Upstream operations Management Group (UoM Group), but new features and corrections come with the Trader’s and Scheduler’s Workbench (TSW) SAP Fiori Apps. With the My Nominations App, schedulers can monitor nominations, quickly change nominations, access event information and set up a new schedule via Create by Reference and Mass Update. The new FIORI Regional Inventory Overview App allows schedulers to get alerted on issues, monitor their terminals, view physical stock, and act on alerts & issues using the integrated Inventory Planning Workbench (IPW). Leveraging the new FIORI Mass Change Events App schedulers can monitor event changes, create and maintain nomination events and mass change events for multiple nominations. Using the IPW, schedulers can view supply chain, monitor inventory, simulate & publish schedules, share planning with peers and set up personalized alerts. Within discrete industries, the restriction concerning transaction MB documented in SAP Restriction Note 2349454 has been removed for SAP S/4HANA 1610, Aerospace and Defense. MB** transactions have become obsolete in SAP S/4HANA. As a example the transaction MB11 is now replaced by the transaction MIGO. That’s why the same has been enabled as a part of the SAP S/4HANA 1610 FPS01 release and the restriction has been removed. There have been many innovations for all the lines of business. In the following, I will go into details for Finance and Supply Chain. Besides a number of new and enhanced apps, the following features are enhanced in SAP S/4HANA 1610 FPS01: master data for consolidation, flexible upload and currency translation. Let me elaborate on the new SAP Fiori app for Treasury and Risk Management. With the credit line analysis you can gain an overview of the trend of the total credit line, of the available amounts and of the amounts consumed by money market and trade finance transactions. These key performance indicators are displayed for a specific period, key date, company code, currency, and counterparty for the purpose of making future funding decisions. You can view the total credit line, the available and the utilized amounts in a chart or a table. The newly shipped FPS01 also enables a new and very important feature for the LoB Supply Chain: The SAP Catch Weight Management (CWM). With this feature you use a parallel, variable quantity in inventory management to valuate goods movements independently of their logistic quantities. CWM is specialized in covering the needs of the consumer products industry in general, and the food processing industry in particular. Therefore CWM provides you with processes and functions to manage materials in two independent units of measure throughout the main inventory management. CWM is involved in areas of the supply chain such as sales, purchase, materials management, production, quality management and logistics execution. There are also CWM functions available to handle particular requirements, such as physical inventory for CWM materials that arise from the second quantity in inventory management. One of the major innovations in integration is the integration of SAP S/4HANA with the Ariba Network which now supports many collaborative supply chain processes, e.g. transferring purchase order line items of item category “subcontracting” from SAP S/4HANA to the Ariba Network or sending goods receipts from SAP S/4HANA to the Ariba Network. Moreover, the invoice collaboration process now supports invoice verification using SAP Ariba Invoice Management. This allows you to perform invoice verification for several procurement systems centrally in the cloud, if required. The SAP S/4HANA Migration Cockpit is a new migration tool that is shipped exclusively with SAP S/4HANA. The focus is to support customers in the migration process with the “New Implementation” transition scenario. The tool is based on proven migration technologies and is available for SAP S/4HANA Cloud Edition and for the SAP S/4HANA 1610 edition. The SAP S/4HANA Migration Object Modeler is a design tool for enhancements and modifications of pre-defined migration objects for SAP S/4HANA. The focus is to give more flexibility during the migration process within the New Implementation transition scenario by adding customer specific enhancements. It is available for SAP S/4HANA 1610, but not yet planned for SAP S/4HANA Cloud. SAP has accelerated new localizations for following countries: Brazil, China, Russia, Saudi Arabia, Japan, Turkey, India, Hungary and South Korea. One of the most important innovations can be found for Japan. With the new feature for Finance, you can now edit journal entries or invoice summaries. With the Subcontracting with Chargeable Components functionality, customers can perform activities related to subcontracting in compliance with the Subcontracting (Shitauke) Act of Japan. This functionality is compatible with the material ledger when transaction-based material price determination is used. Follow us via @SAP and #S4HANA. Thank your Rudolf for posting this timely blog with all the details about this release. I find this very useful and looking forward to talking to my client about this from today onwards. Can someone share the info where the FP can be downloaded?